It seems that there are as many marinara sauces as there are cooks on TV. Everyone has a version and all that I’ve tried are equally good. Today I’d like to share a recipe that I learned from a PBS cooking show some 20 years ago. I’ve long-since forgotten the show/chef’s name but I learned this marinara to serve with a very special lasagna. (You can find the lasagna recipe HERE.) Like any good marinara, this sauce can be used in any number of dishes. Add oil to a medium sauce pan and heat over a medium-high heat. Add pepper flakes and cook for 2 minutes. Add garlic, season with salt, pepper, & parsley and sauté for 2 minutes. Add crushed tomatoes, sauce, marjoram and wine. Stir to thoroughly combine. Bring to boil, reduce to a soft simmer, and cover. After 45 minutes, remove cover and continue to simmer for another 45 minutes. Add basil just prior to serving. 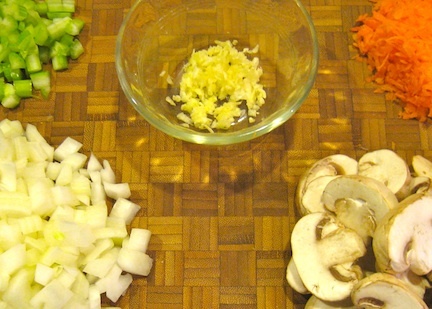 This sauce originally accompanied a lasagna recipe that included mushrooms. That’s why mushrooms aren’t among its ingredients. If you intend to use this recipe for something other than that particular lasagna recipe, feel free to add mushrooms –sliced or otherwise — about 5 minutes after the carrot, onion, & celery have been added. Continue sautéing as indicated above. 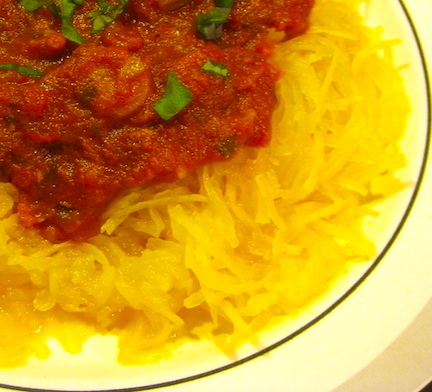 This entry was posted in Sauce/Gravy (Ragù/Sugo), Vegetarian and tagged Cooking, Italian, Recipes, Tomato Sauce by ChgoJohn. Bookmark the permalink. And if I wanted to add mushrooms to the sauce? Or is that an altogether separate sauce? Good stuff! And this is what I’d call a Marinara sauce, too. Although I know some people would object to cooking the sauce that long – they’d be more apt to call this a red sauce — or “basic” tomato sauce 😉 . Of course some of those same people say you shouldn’t combine both garlic and onion in a tomato sauce, which I think is nonsense. I don’t often use marjoram, because I like the in-your-face flavor of oregano. But maybe I should rethink this. Anyway, thanks for this. Hello, John. Yes, I’m aware of the no onion & garlic rule but never pay it any mind. That’s certainly not the case in Le Marche, the area of Italy my family is from. All of the family “chefs” added both to their sauces. We, also, use oregano but only sparingly, if at all. Marjoram is sometimes used and it’s pretty much a hallmark of Marchigiani cooking. Thanks, John, for always leaving such great comments. Thank you, Judy, for always being so complimentary and encouraging when you leave a comment. I really do appreciate it. Lovely sauce, John. I really like the added depth of flavor the red wine brings to the party and the crushed red pepper flakes bring that added touch of heat and character to the sauce. All the way around, a superb sauce. What’s the difference between crushed tomatoes and tomato sauce in a can? Please let me know….thanks!